First play for Aaron. Nadine does not like the game, which she remembered soon after starting. Aaron wasn’t nuts about it, either. Haim and I played a few rounds. First play for all of them, I think. This is a mammoth Euro/Ameritrash combo game that took 4 hours. In the end, they all tied with 3 points each. And Nadine won on the tiebreaker. Nadine writes: Argent is a very nice and interesting game. Worker placement with lots of options, you can activate cards in addition to placing workers, each player has a special ability. There is complex synergy between the options, with three different types of cards. You get compensation if someone wounds you (kicks you off your spot), and there are defense cards. 12 of 18 end game conditions are in the game, similar mechanic to Troyes except it’s all who has the most, no second place unless one or both of two second place cards are in the game. You can get markers to look at cards. I focused on 3 things, based on cards that I saw early – Influence track which breaks ties, this was one of the two cards that weren’t hidden; Diversity which is most different colors of cards, which works against collecting the most in one color; and Markers. I knew that if I was first in Influence and had all the markers I’d win the tie, it turned out that no one else had 12 markers, but I tied in Diversity with Lorenzo. He was second on the track so also won some ties with the others. We played on the A sides, I was purple and didn’t take any red attack mages. We all ended up with 3 cards / points at the end, which makes sense in a balanced game. Gili had played once but ran out of time so only played four rounds. It has some luck, possibly the right amount. Second play for Haim. First play for Elad, who picked it up quickly. I found myself grinding to a halt early on and I never recovered. I don’t know why, exactly. I never go for whiskey barrels. Haim always seems to have one too many tiles at the end. First plays for Haim and Elad. These scores don’t count for much, since I accidentally used the decks in the wrong order: C, B, and then A, which makes for a ridiculous game. I think they liked the idea, however. Haim called it a complicated version of Splendor. I find it interestingly complex for something that looks kind of simple. And the green bits are nice. First play for Aaron and Aryeh. We played with the rules: 1) Every invention causes all other players to lose 2 coins, and 2) You gain +5 points if you have 5 or more cards in your hand. The first rule was bad enough with 3 or 4 players, but harsh with 5. It made money hard to accumulate, and therefore increased the value of minions. Aaron placed three of his minions on Work and was raking in good money. I had 3 on Invent but wasn’t making as much. Assaf and Aaron both hit exactly 20 points: 15 and cards, but Aaron had 6 cards, one of which cost nothing to play; Assaf only had 5 cards. I was one round away from hitting 22. First play for Natan, second for Aaron. Everyone was convinced that Gili was going to take this; she got ahead by phase 2 with some super animals and also had tons of +4/building type bonus tiles. I narrowed the gap with two six-tile regions, and I also had both bonus tiles for selling goods. They were worth 11 and 18 points each. I leaped ahead with three 7-point “first to complete a color” tiles, one more bonus building for these tiles (6 points), and 8 points in coins. I didn’t add a single animal. 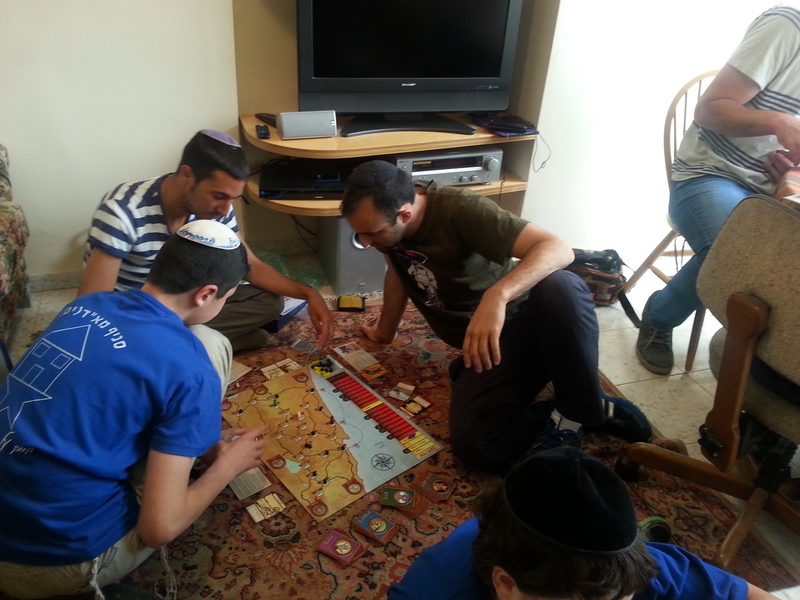 First game for all but Binyamin, I don’t know the game. I also don’t know what happened. They played this while we played Castles of Burgundy. I also don’t know how this game went. They played this while we played Castles of Burgundy. First play for Binyamin. A light game to end the night. A pleasant games day. Amir, Omri, Roee, Rudo, Gilad, and Koby all came from the coastal areas, which was nice. We used both sukkahs, and sometimes had to look for extra chairs. At night, we also had to find a light for the other sukkah and finally managed to get it plugged in. I think that was the list. Several of these were new players, yet they still played a six player game, double powers, comets and asteroids, and what looked like half the flare deck. Mace got to four bases fairly quickly as Prophet / Loser, but was then ganged up upon. The game then extended for another three and a half hours, until Mace finally managed to win in the end, anyway. Other powers in the game included Pentaform, Vampire, Plant, Mirror, and others. 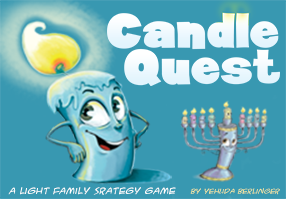 Binyamin and family played this. This took them a while on a full board. Michael is somewhat better than I am, and so proved a closer match for Adam. Koby brought this game and taught it to the others. This is Nadine’s Jewish themed version of the game Ra. Played in the other sukkah. Frodo was stomped to death by the Balrog while trying to pass through Minas Tirath. Zvi Yehuda wanted to play this later in the day, but no one had time to explain the English to him. First plays for all of them, they all really liked it. Good thing we still have Nadine’s copy around. It may see more play again. David and I got one draft and game in, and e beat me as usual, even though I played a four color deck and wasn’t mana screwed, and he played a three color deck and was. This is an are control game from Bruno Faidutti, and has his characteristic elements of chaos and bluffing. Which, unfortunately, I don’t like, although I like Bruno Faidutti. You have ten rounds, scoring after rounds 5, 8, and 10. You have four ships active at any one time going to 10 different areas of Mars, and holding between 2 to 5 astronauts. And you have 9 character cards, that let you a) add astronauts to one or two ships, and b) do a special action, including moving your astronauts, swapping an astronaut, and redirecting or blowing up a ship. The latter two, in particular, are the most chaotic parts. Lastly, you have bonus points for a mission, or can put secret cards under many of the areas, so that, at the end of the game, that area scores nothing, or double, or gives some other random bonus. More chaos. Each round, each player selects one of their characters and then turns it over in turn order, like Citadels. You only get your cards back if you play character 1. Nadine and I lost mostly because we didn’t understand the vast importance of the areas with more points, which exponentially accumulate in latter scoring rounds (I somehow thought they would be linear). So we didn’t fight for them more. It’s not a bad game, and certainly not as annoying as Assassin, but I still screwed Nadine out of her moves twice at the beginning of the game, which was probably not enjoyable for her. And there’s no reason for it. If the cards are played like El Grande, instead of like Citadels, and if the cards placed on regions are placed open instead of closed, the game looks to be vastly more fun and interesting. I survived with three suspects until round 8. I only had an unseen Jack in one round, and Nadine had to ensure that I didn’t escape, preventing her from discovering anyone that turn. Nadine then accused the right person, and not entirely at random. One of the three she had eliminated with a card from the red guy. And one of them she thought I had been positioning more for exit than the other. I took over for someone in round four, but I forget who. We played on the German map, missing the south coast. Aside from the western area, prices were pretty expensive. All of us except for Mace started on the western shore, anyway. Larger plants came out fairly early, and I snagged my entire plant needs before anyone else. Still, because I was behind in cities, I was producing less money, and so everyone else managed to catch up with their plants and building. In the end, I simply couldn’t build more than Shachar owing to less cash. I’m still not quite sure how that worked. Elijah and Mace were up to 14 cities when we were all at 12 on the last round. They had a bidding war over the only plant that would let one of them win, but it went too high for either the winner or loser to win. If it hadn’t Elijah could have won after all. 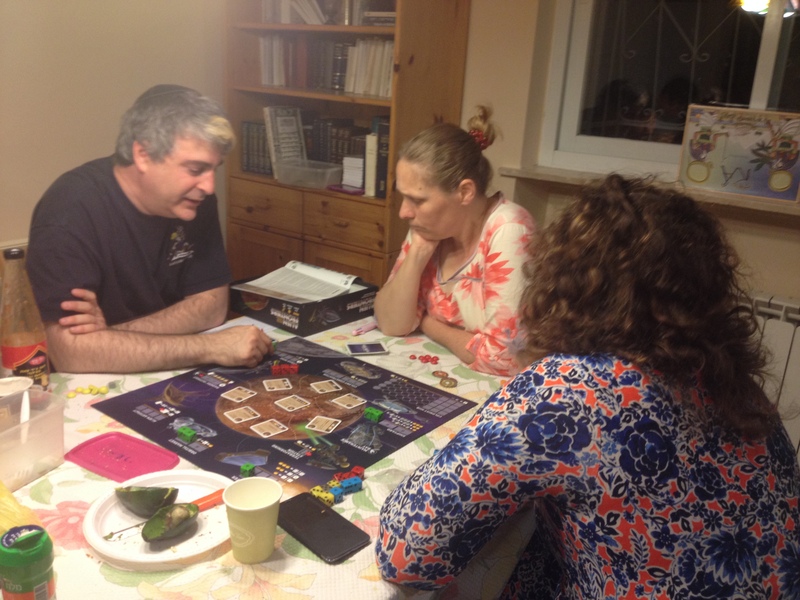 Rachel was convinced she wasn’t going to win when Nadine and I took second big buildings and Adam secured her first. She and Adam both had Harbors to Nadine and my Factories. But she played on anyway, taking a Discretionary Hold, something I probably should have taken. It was all very close, but Rachel managed to ship 43 shipping points to my 21. Yowza. The opening game. Played again at least once later during the day. Yosef won every game he played tonight, I believe. They played to 13, but it didn’t help. First plays for all but the first two, I taught them and then hovered around a bit to help them start. Luckily, Nadine was also sitting nearby and could fill them in on a few rules that I forgot, as well as help Avi on his first game. First play for Yosef. Nadine and I looked over in mid-game, and Gili had a 20 point lead. We said that they should just concede, although Yosef did have a handful of cards. Well, it seemed that Yosef was more persevering than we realized, making a dramatic comeback. First play for Yosef, and Devora and Iska are very small kids, so I’m sure they weren’t experienced players. I don’t know any more about the game. Rivka played this shape game with two of her kids. First plays for Gilad and Koby. First plays for Omri and Rudo.